Immigrants can have a large impact on housing demand. Research from NAHB in 2012 demonstrated that using the low end Census projections on net immigration (1.2 million annually), after 10 years new immigrants would occupy 2 million multifamily units and 1.2 million single-family homes. In addition, the Research Institute for Housing America projects that from 2010 to 2020, immigrants will account for over one-third of the growth in homeowners and over one-quarter of the growth in renter households. Although homeownership is often discussed by age and race, homeownership among immigrants is less closely examined. Understanding the immigrant homeownership experience is important for several reasons. The first is that immigrants are projected to be a significant part of homeownership growth in the near future. Secondly, homeownership among this group leads to positive spillovers including wealth accumulation and community involvement. Finally, learning about the immigrant homeownership experience may shed light on the broader housing market. Recent research by economists from Rutgers University and the Georgia Institute of Technology offer important clues on this topic. 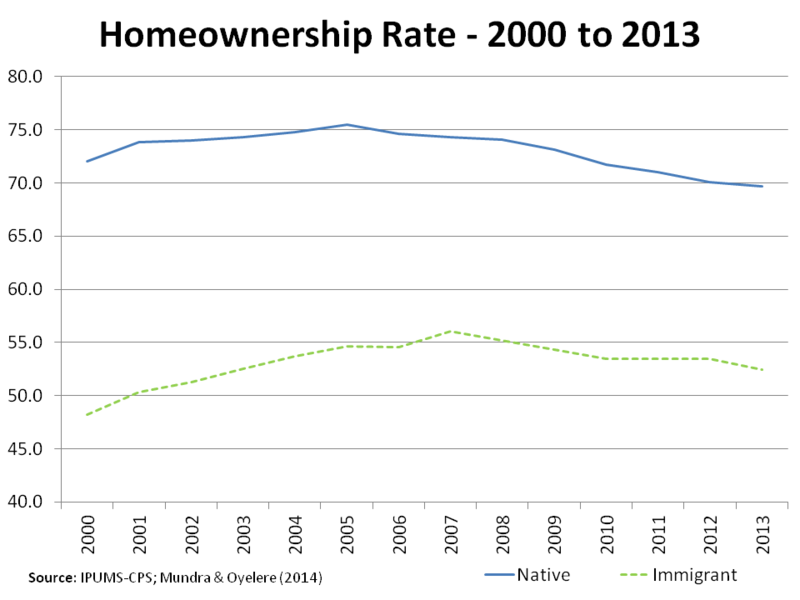 Using data from 2000 to 2012, the authors examine homeownership among immigrants and find that although homeownership rates fell during this time period, the decline in immigrant homeownership was less severe when compared to native born homeownership. A hypothesis offered by the authors for this result is the ability of immigrants to leverage birthplace networks. Birthplace networks, a social network of friends and family from the same country of origin, often provide immigrants with capital to purchase a home or maintain ownership during hard times. Birthplace networks are unique to immigrant homeowners. However, one can imagine the importance of similar social networks for native born homeowners. It is possible native born homeowners with a larger social network fared better during the Great Recession than native born homeowners with a smaller social network. Although more research is needed on both homeownership among immigrants and the affect of social networks on homeownership outcomes, the recent paper is an important step. Demographic changes in the U.S. dictate that the effect of immigrant housing demand should not be overlooked.